When you enter this room, you will be welcomed by a deer. 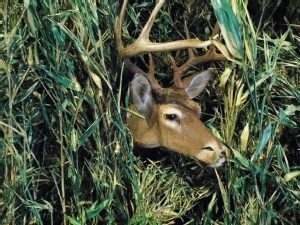 Native Americans depended on large and small game plus native plants for everyday survival. 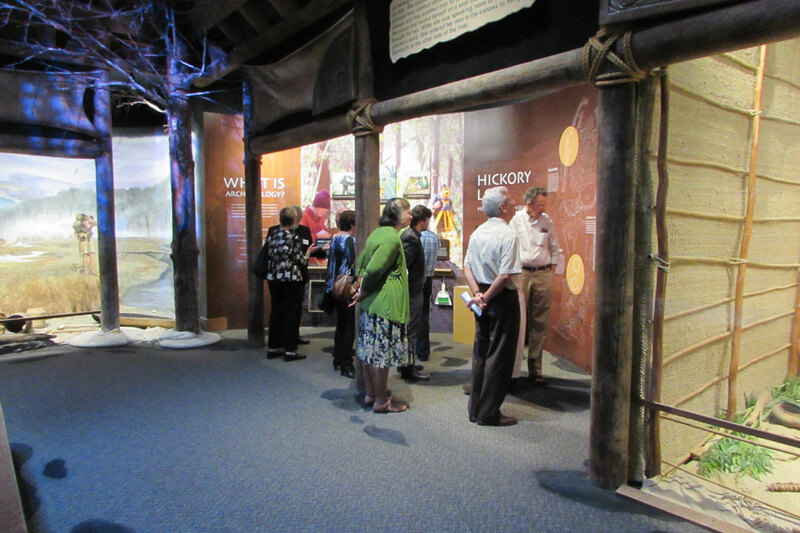 The Hall of the Ancients offers detailed historical information about the Southeastern Indians, Cherokee and Creek, who lived in Georgia. 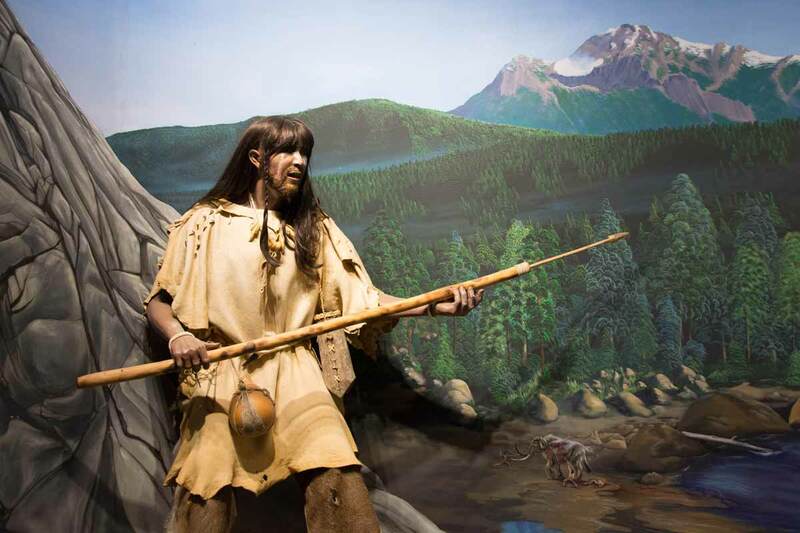 The Life Along the Etowah exhibit explains how the Southeastern Indians depended on the environment for survival. People have lived in the Etowah River Valley for thousands of years, a valley where three great geographic regions meet to create a rich and diverse environment. These Native Americans respected the land and protected it because it provided for all of their basic needs including food, shelter, clothing, tools, weapons and transportation. The History Beneath Our Feet exhibit, explains how archaeology plays such an important role in our understanding how people lived long ago. 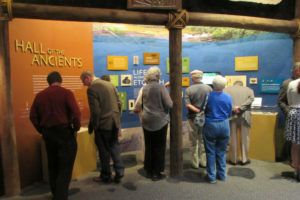 Photos of the actual excavation of the 1995 Cherokee County Hickory Log site show how archaeologists unearthed artifacts, some displayed in this exhibit. An excavation site map shows where the "dig" took place prior to the construction of the Canton Walmart. 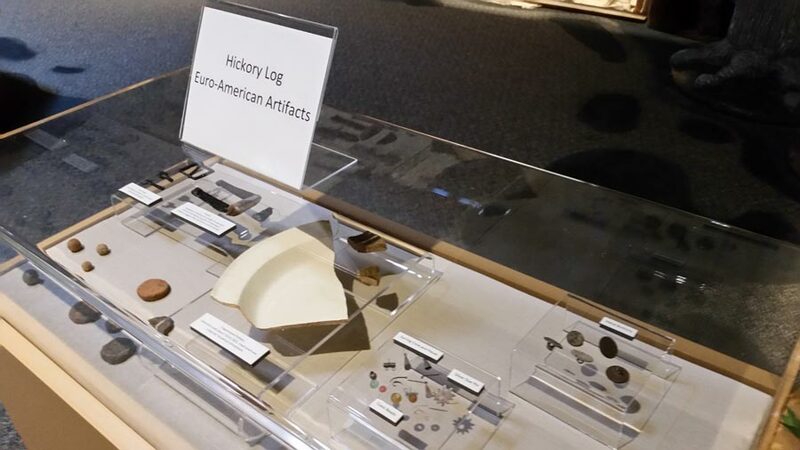 Artifacts recovered from this Hickory Log site reveal multiple Native American settlements, some dating back more than 2,000 years. Remnants of the Historic Period - mostly trade goods of iron and ceramics - offer a view of daily life along a cultural borderland during the decades before the Cherokee were foced to leave this area in 1838. 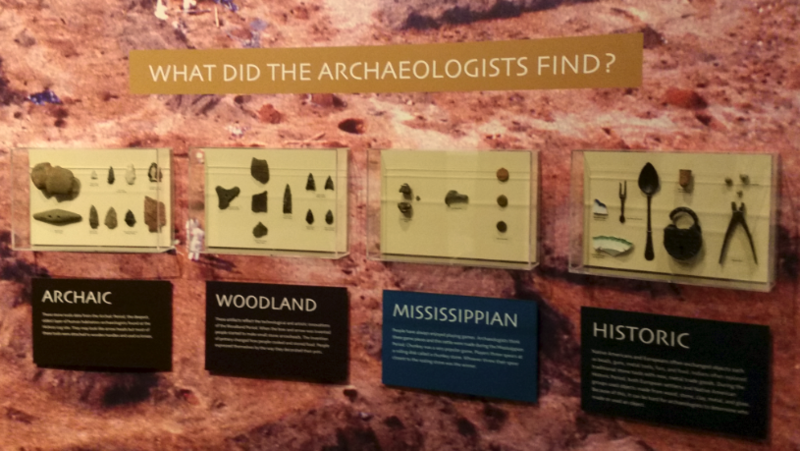 Artifacts were also discovered from the Archaic, Woodland and Mississippian periods of time. Thanks to everyone who donated funds toward curating artifacts from the 1995 Hickory Log excavation. Also, thanks to all those who made donations for new exhibits that display some of the best artifacts from the collection. The centerpiece of the Hall of Ancients is a massive petroglyph. This ancient and mysterious carved rock was found years ago on the Cline property, also located in the Hickory Log area of Cherokee County. Early witnesses say there were three rocks. However, an analysis revealed that this was the center of a larger singular rock with two sides having been broken away from the surviving center. This could have happened naturally by earthquake or as legend would have it, by white men blasting the original rock looking for gold. The carvings on the rock appear to be from the Mississippian period of time, 1000 - 1550 AD. The designs on Reinhardt's petroglyph are identical to those found on boulders along the Atlantic Coast of Ireland which date from the Early Bronze Age. The Irish petroglyphs were carved by non-Celts at least 1,500 to 500 years before the use of a unique form of Celtic writing. Irish researchers are not certain of the original meaning of the concentric circles, but many of the Petroglyphs seem associated with graves. A new exhibit about Cherokee Life from 1800-1838 will open 2019 in the Heritage Center Buffington Gallery. 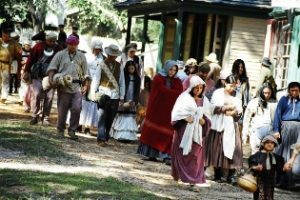 Visitors will see information about the day to day life of the Cherokee people before they were relocated to Indian Territory in Oklahoma. The Cherokee Nation included parts of Georgia, Alabama, North Carolina and Tennessee. Members of "Five Civilized Tribes" from these southeastern states were all removed from their homeland and relocated in the west. Before the 1838 Cherokee removal, these people were living very much like their white neighbors. They were farmers, blacksmiths, owned saw mills, ferries, grist mills and other businesses. They also had their own newspaper, the Cherokee Phoenix. Some had plantations, raised cotton and owned slaves. 2018 commorates the 180th anniversary of the removal of the Cherokee in what is known as "The Trail of Tears." In this section of the Hall of Ancients, you will see a large map in this area indicating the routes taken from Georgia to Oklahoma. 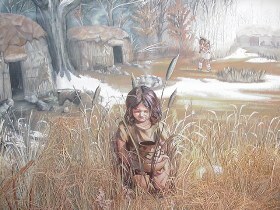 This museum is located in Waleska which is in Cherokee County, Georgia. In the Cherokee Nation, this District was named Hickory Log. In the new exhibit you will find out more information concerning the actual removal. Donations from museum members, volunteers, friends and staff matched a grant $1 for $1 from the Hudgens Foundation. 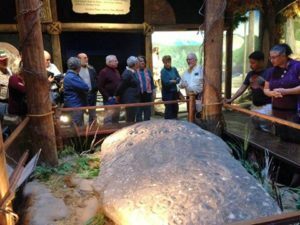 Thanks to these donors, two exhibits in the Hall of Ancients, History Beneath Our Feet and Life Along the Etowah were added to the Hall of Ancients in 2016. Funds will also be used to for the new exhibit. Thanks also to the Georgia Chapter of the Trail of Tears Association for their assistance. *Copies of this two-hour DVD are available for purchase in the museum gift shop. The film is hosted by well-known Cherokee actor Wes Studi and narrated by James Earl Jones. Other celebrity voices include actors James Garner and John Buttram, singer Crystal Gayle, former Virginia Governor Douglas Wilder and a host of historical experts from major universities. A small area in the Hall of the Ancients is designed for young children. 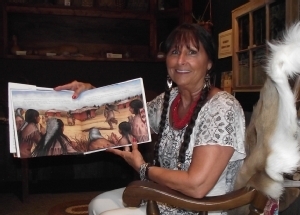 Children's books about Native Americans and pioneers are available for young readers or parents to read. Using hand puppets, children can act out stories about animals that inhabited this area long ago. 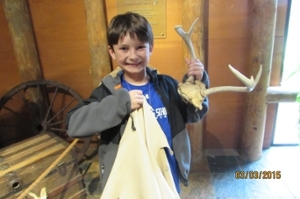 They can also touch gourds, deer antlers and other items used by Native Americans. 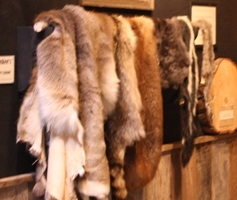 The children enjoy touching actual skins of animals that live in Georgia including deer, racoon, beaver, rabbit and skunk skins.